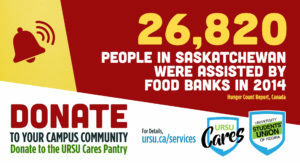 One of the many services that we offer is our URSU Cares Pantry. This valuable service offers food and other necessities to more than 100 students who are facing food insecurity within our campus community. Started in 2016 with the support of Regina Food Bank, this program has flourished and been one of our fastest growing programs. Unfortunately, earlier this fall we were informed that Regina Food Bank will not be able to stock the Pantry as their own supplies are becoming limited. This development is not only heart-breaking for us but more importantly it can be life-altering for all those students who have come to depend on this support from URSU. That is why we are appealing to you — our campus community — in an effort to keep our Pantry full and our students fed. Look for our blue bins around campus and drop off any donations you can spare. We are looking for non-perishable food, toiletries, and other essentials that we can distribute to students. 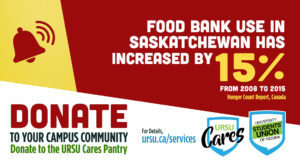 Financial contributions will also be accepted and can be dropped off at the URSU Member Services Desk located on the second floor of Riddell Centre (RC 221) from Monday to Friday 8:30am to 4:30pm. 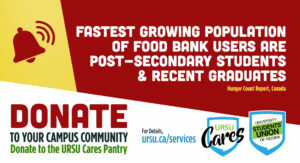 Students who become members of the URSU Cares Pantry program are able to get free groceries and toiletries. Examples of items available include fruits, vegetables, cereal, Kraft Dinner, jams and spreads, bread, canned food, deodorant, shampoo, soap, toothpaste, and a lot more. Members are asked to take no more than 1 of each item. If there is something specific you’d like to see in the future, let us know and we’ll do our best to accommodate you. Allowing URSU to contact them via email for any URSU-related programming or services. Allowing URSU to approach them for further information when they have used the pantry 10 times. We will ask about your financial situation and needs to make sure that greater help can be offered if required.